*I was allowed 1 1/2 cups of milk, 50g sugar, 1 1/2 eggs, a few handfuls of kale, and some garlic as my team mate and I reached fundraising goals. Yip, that's it. No salt or pepper, no quick snack fix when you're on the go. It was literally torturous. I signed up to the challenge after my flatmate, Kelsey, asked if I would do it with her. I thought it would be a great way to raise money to support refugees, (I raised $1033.60 and we raised over $2000 as a duo) but little did I know I would learn lessons that week that would change my life. The first day was rough. My body was crying out 'feed me!' from about midday, and headaches developed in the afternoon. Even though I was having rice and very small portions of the other foods, I would never leave a meal feeling anywhere near full. I knew I had to ration everything out, so that I wouldn't get to the last day with nothing to eat. I was consistently hangry (hungry + angry), and went to bed super mad at myself that I had ever said yes to this silly challenge. During the week, naturally, I was asked if I was hungry. On the first few days I would say 'HECK YES I'M STARVING', but on the third day, it changed. It wasn't so much the hunger, my body had gotten used to that, but the lack of protein, nutrients, and all the good stuff that comes from vegetables and grains. I was exhausted. My mind was consistently in a cloud, and I couldn't focus properly on people's words as they spoke to me. My eyes took longer to focus on things, and I had to cut out exercise. To keep my body moving, I attended yoga daily, but that nearly took too much energy too. I felt awful. Imagine someone has stuffed cotton wool in your brain, but you can't remove it. A good nights sleep, some water, a rest; nothing would set it free. I felt trapped, and that's when my emotions started to go haywire. "I can choose to eat again on Monday, but Syrian refugees cannot." This thought ran through my head most hours. The feeling of prolonged hunger was so thoroughly horrible, but I knew I would escape it. Others would not. There are still people doing The Ration Challenge today, not by choice, it's their reality, and that kills me. I remember sitting in my home office when this thought first hit me: I cried. The pain of prolonged hunger is so terrible, I would never wish it on my worst enemies. Throughout the challenge, when I hit different targets, I was allowed to add more foods to my weekly rations. I had 1 1/2 cups of milk, 50g of sugar, a spice, some greens, and an egg. Whenever I hit a target, I did a literal happy dance. I often have two boiled eggs for breakfast in the mornings, but when I hit my last target and was allowed to have an egg, it felt so novel and AMAZING. Rice pudding: rice, milk, and sugar (only for about 3 breakfasts as I didn't have much milk and sugar). 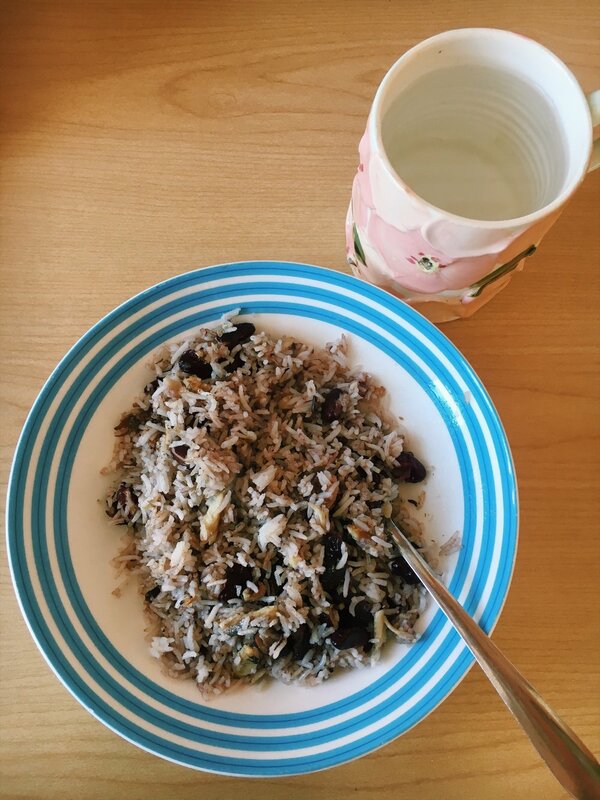 Rice, kidney beans, kale, and some garlic with a lovely cup of hot water. Rice, kidney beans, kale, and I think a tiny bit of egg from my win of reaching a huge target. This was a FEAST for me. Flour, oil, and water. Drizzled with a sugar syrup made from water and sugar boiled on the stove. 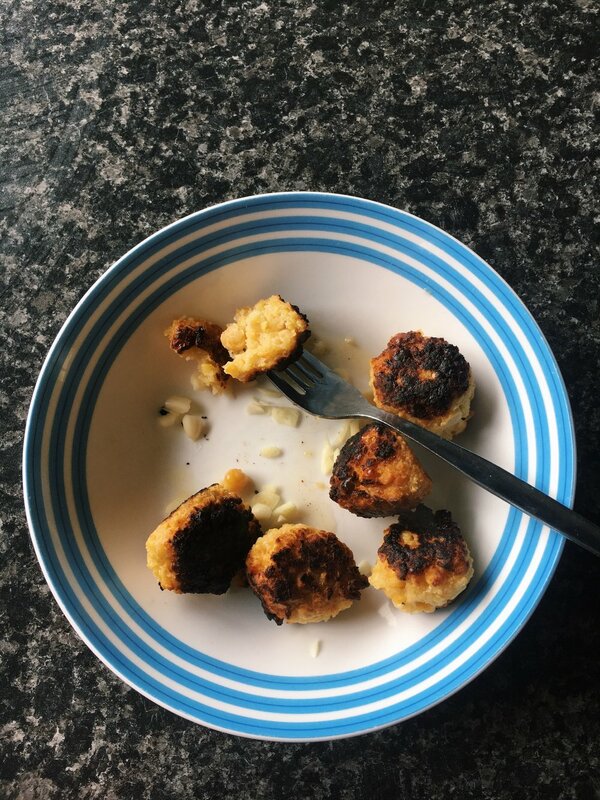 Burnt my chickpeas, no salt or flavouring, but they were INCREDIBLE. The best Saturday: eating an egg. We reached over $1000 each, and got to drink a cup of tea! THE BEST TEA EVER. When you think about the rations, it sounds pretty easy. But forcing rice into your mouth after 4 days of eating it straight, is harder than it sounds. I used to (and still do) eat plain rice as a meal all the time, but the consistent lack of flavour was the hardest part. Some meals, I simply didn't eat and went to be at about 7pm because I couldn't stand being awake and starving. But the thing is, I had a stove to cook it on, a fridge to store my lovely rice in, a roof over my head, constant access to unlimited water, and a safe life. Syrian refugees have none of these things. The Ration Challenge must sound pretty easy from their point of view! Every time I eat, I am conscious about my privileged situation and thankful for the ability to eat whenever I wish. I will never take food for granted again (I'll try my best not to! ), and work on reducing my food waste at all costs. I won't ever sit down to a meal again without thanking god and the universe.